"Beautiful laminate floors, granite countertops, brand new stainless steel appliances & more!" Address: 152 Driftwood Lane, COMPLETELY REMODELED - ALL NEW! 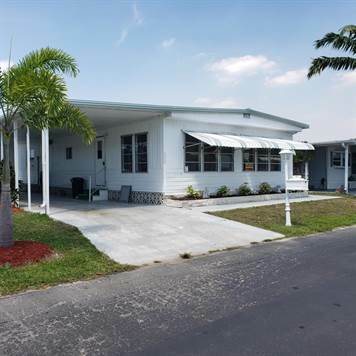 Large two bedroom two bath home located in Naples Estates, a 55 and up age restricted community with lot rent of $745.50 per month. Naples Estates is in the process of many new and exciting changes including a brand new state of the art clubhouse, fitness center, grand ballroom and kitchen, ceramics studio, bandstand and party pavilion, pet parks, pickleball courts and more! This community is being designed for active adults! Completely remodeled home has a wide open concept. Brand new kitchen cabinets, 3 cm. granite counter tops, double, deep stainless steel sink with gooseneck faucet, attractive subway tile on the backsplash, brand new stainless steel appliances, large island in center of kitchen with storage underneath, and all open to the large living room. All lights and ceiling fans are brand new and attractive recessed lighting in the kitchen. There is a second living room/family room at the front of the home with windows across the entire front. Both bathrooms are brand new with beautiful, large porcelain tiles on the floors and shower and tub surrounds. Completely brand new vanities in both bathroom and energy saving toilets. Both bedroom have two closets with new mirrors on the doors. The air conditioner/ heat pump is relatively new and works great! Outside under the carport is the shed with full size washer and dryer. This home is vacant and ready for immediate occupancy - waiting for a new homeowner to enjoy all the brand new remodeling just completed. Call for more information or to schedule an appointment for a personal tour.